Who would’ve imagined that in March 2008, the Dollar/Shekel exchange rate would be less than 3.5! For most Israeli’s, the dollar was always considered a very conservative and safe investment. Not anymore! In the past year, the dollar has lost ~20% of its value. Of course, there are always those who win and those who loose from these types of fluctuations. But for Israeli start-ups, this is not good. Our companies have always prepared their budgets in US dollar. When the dollar weakens, it means that more cash will be used to make payroll, effectively reducing the time that a company has to operate. This means that it will require more capital to reach the same milestones as before, or in other words, makes it more expensive to operate. 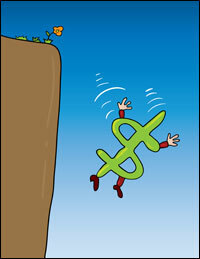 I’ve been asked by blog readers if the dollars’ nose dive impacts company valuations. Indirectly it does, as companies need to raise more money than before. In some cases, this will mean higher dilution for founders, in others, more capital invested by the venture capitalists to buy the same ownership. Another question relates to how these start-ups should manage their money. Should they convert their dollars to shekels? A few years ago, this would’ve been unheard of. These days, not sure it’s such a bad practice. By investing your capital according to your exposure (meaning if 20% of your expenses are in the US, and 80% in Israel, perhaps keep 20% of your funds in US dollars) you at least guarantee that you can meet your expense plans. But if the dollar regains its strength, you will not benefit from that if you choose this approach. There are so many things that start-ups have to deal with. Now another issue joins the list of things to worry about. This post has been included in the latest edition of Haveil Havalim, The Jewish/Israeli blog carnival.